In its latest report ‘Domestic Replacement Door and Window Market Report – UK 2016-2020 Analysis’, AMA Research further reinforces other recent market data that the market is witnessing positive growth. According to AMA, in 2016 the market for domestic replacement windows and doors was estimated to have grown by 3% in value terms. Following good growth in 2014, the market has reverted to lower growth rates in 2015-16, reflecting the mature state of the market and the high rates of household penetration of double glazing. Future growth in this market remains dependent on a positive housing market, but our forecasts for 2017 and beyond remain muted, with the uncertain economic situation a central factor. In material terms, PVC-U is dominant in the replacement windows market, with the direct sell route particularly strong. However, PVC-U continues to face challenges in the entrance doors and patio doors sectors where composites and aluminium, particularly for bi-fold doors, continue to take share. 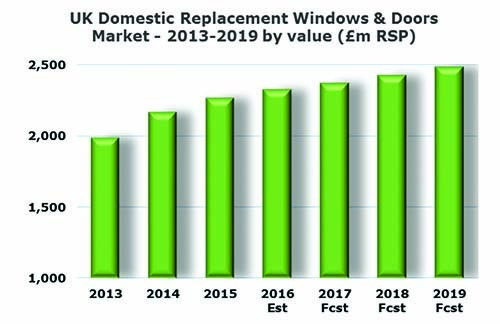 Volume sales of replacement windows have been in steady underlying decline for a number of years with key drivers now focused on “re-replacements”. In terms of market trends, security, acoustic and thermal insulation properties as well as sustainability remain core themes in this market. In addition, in recent years companies have increasingly offered quality products with a wider choice of options – for example there is now a very wide range of frame colours available right across the market, something that was rare even a decade ago. In the entrance door sector, the share of composites has grown and in 2016 is estimated to account for nearly one third of the market. This has been mainly at the expense of PVC-U with timber still retaining largest share in terms of materials mix. Growth for replacement entrance doors has been higher than for replacement windows with key drivers including security issues, wear & tear from climate/regular use as well as the fact that replacing the front or back door represents a significantly smaller investment than would be needed for replacement windows. The patio doors sector has been boosted by the recent trend for bi-folds as replacements for existing patio doors. In addition, patio doors (including bi-folds) have also benefited from the home extension sector and the trend for increased daylighting. A return to the volumes seen in the 1990s remains unlikely due to the high penetration level of double glazing and improved replacement products with longer life cycles. However, new legislation may encourage replacement of windows and doors to some extent, as increasingly stringent regulations for thermal efficiency and security continue to be introduced. Another key driver for 2nd and 3rd time replacement is likely to be aesthetics as householders opt for different colour and glazing options for windows and entrance doors in order to maintain an up-to-date look. In addition, emerging niche sectors are also likely to continue to offer opportunities – bi-fold doors have been a recent example as homeowners look to open up access to their garden areas with large, flexible glazed areas. 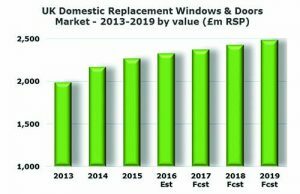 The ‘Domestic Replacement Door and Window Market Report – UK 2016-2020 Analysis’ report is published by AMA Research, a leading provider of market research and consultancy services within the construction and home improvement markets.